The Philadelphia 76ers Nike Courtside Men's NBA Jacket offers the ultimate complement to the team's hyper-local City Edition uniform. It features a plush, quilted lining, and has the hand-crafted look and feel of a true collectible. A COLLECTIBLE JACKET TO SHOW YOUR PRIDE. 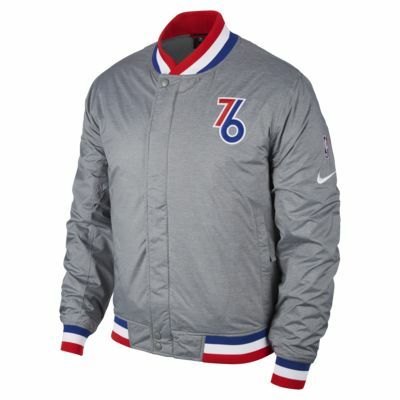 The Philadelphia 76ers Nike Courtside Men&apos;s NBA Jacket offers the ultimate complement to the team&apos;s hyper-local City Edition uniform. It features a plush, quilted lining, and has the hand-crafted look and feel of a true collectible. Woven fabric with quilted, insulated lining keeps you comfortable. Have your say. Be the first to review the Philadelphia 76ers Nike Courtside.